Want to add an exciting spin to your breakfast routine? 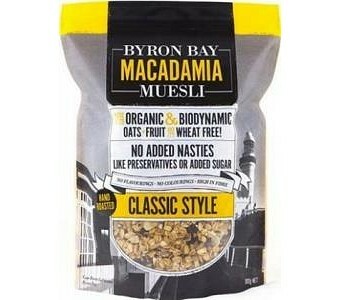 Then Byron Bay Classic Macadamia Muesli will definitely start your day off on the right track. Enjoy every spoonful of Byron Bay Classic as it’s made with delicious macadamia honey roasted muesli that is simply irresistible. For added nutritional value, top it off with some fresh blueberries and strawberries with a little drop of honey and enjoy the crunchy sweetness of Byron Bay Classic Macadamia Muesli. No cholesterol Low in saturated fat and sodium No added preservatives No added sugar Ingredients: Organic Australian oats, organic sunflower kernels, pumpkin seeds, sesame seeds, organic sultanas, organic raisins, spray free macadamia nuts, macadamia honey & cold pressed macadamia oil.